Choosing the right tiles for your bathroom needs some careful consideration. With so many varieties on the market, it’s easy to become overwhelmed by the choice on offer. Choose from ceramic, slate, glass and metal tiles, plain or patterned, large and small, smooth or textured. The options are seemingly endless. 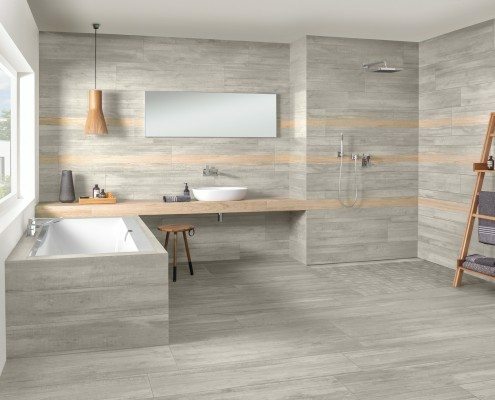 So, to help you through the decision process, we’ve put together some practical tips, making finding the perfect tiles for you bathroom, a breeze. Ceramic tiles are the most popular by a long way. They’re durable, their glazed surface makes them highly resistant to harbouring germs, they’re usually very easy to keep clean, and come in styles to suit every taste. If you opt for ceramics, the most important thing to be aware of is that they do tend to vary from lot to lot, so make sure all the boxes you buy are stamped with the same lot number. With the majority of bathroom suites being sleek and white, tiles are a great way to add texture and interest into a room that can otherwise, look fairly clinical. If you’re talking floor tiles, texture is a must. It sounds like common sense, but many buyers are still seduced by lovely shiny tiles and then end up skidding all over the place every time the floor’s wet. Generally, the rougher the texture, the less slippery the tile when wet. When it comes to wall tiles, shiny tiles look chic and sleek and reflect light, making them a good option when in small or dark spaces. On the other hand, embossed tiles can be a smart way of adding interest to your walls and reducing starkness, especially if your tiles are in only one or two colours. It goes without saying that white is by far the most popular colour choice for bathroom tiles. White tiles are fresh-looking, classic, and reflect light to give the illusion of a more spacious, lighter room. If you’re worried about the room looking too stark add dark or patterned towels and other accessories to introduce splashes of colour while retaining the clean minimalist look.